maart 2008 | 230 blz. This book analyzes whether, and to what extent, the exercise of extraterritorial jurisdiction in cartel and merger matters is in fact lawful under international law. It does so from a transatlantic perspective, with an emphasis on practice in the United States and the European Community. 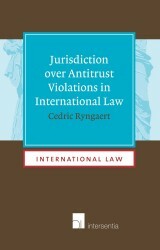 The book mainly focuses on the use of the controversial effects and implementation doctrines of jurisdiction.